Having published James Deverell’s story earlier this week, I decided to compile some background about Tongataboo, a name I had only heard of in connection with Captain Cook’s landing site in Tonga (spelt Tongatapu) before I began my research. James’ Tongataboo is a small place in Tasmania, near Deloraine. James was amongst its earliest residents and he died some years before its name was changed to Weetah when a post office was established there in 1912. Jeremiah Sheehan, my Great Great Grandfather, also settled at Tongataboo following his marriage to James’s daughter Eliza in 1874. With the exception of contemporary news reports about the state of the road from Deloraine to Tongataboo, there is very little published about the place and what follows is largely gleaned from newspaper reports on Trove. Maureen Bennett’s book, Shamrock in the Clover, tells us that many of the Irish who arrived in the Deloraine district during the 1860s bought smallholdings, usually of about 50 acres. The only land available for purchase was the more marginal land outside the larger estates held by wealthy free settlers. Many of these people settled at Tongataboo, which Maureens says ‘is now Weetah, East Parkham and the back area of High Plains’. Irish families also bought land in another area known as Reedy Marsh and some bought land at Quamby Brook and Quamby Bluff (now known as Golden Valley). The families who settled in these areas had a very hard life. Their houses were originally very rough shelters and they had to work hard to make ends meet. The land which they bought was not usually as productive as that which was rented on the big estates but their only satisfaction was that they owned their own place. Life was particularly hard for women as besides doing all the chores in and around the house they bore large families unless they died in childbirth in the process. Most of them had no transport and walked everywhere. Many Catholics walked several miles to Mass on Sundays usually carrying a young baby. If they wished to receive Communion they fasted from midnight until they returned home. When schools were established the children walked to school regardless of the weather. They usually had many chores to do around the farm such as milking the cows, before and after school. A road runs out from Barrack-street, Deloraine, for four miles, passing through what is known as High Plains, where there are some nice farms, and continuing on for four or five miles down a very rough and steep grade, passing through hilly, if not mountainous, country, full of farms till Tongataboo is reached. The people in this district are hard-working and good-natured, as well as hospitable, but do not comprise the wealthy class, the reason of this being that the land on which they live is not the best. As one journey’s through country like Tongataboo, with its rugged, mountainous character, and sees the kind of roads over which these good people have to drag their loads of produce up to market, one is amazed how they do it. It is very steep, though metalled in places, where it is unmetalled it must be fearful in winter. Certainly the road is somewhat hilly, but when the top is reached the outlook is well worth the trouble. From Everett Hill an excellent view of Bass Straits and the sea-bound coast is to be obtained, while all around one secures a grand panoramic view of highland and lowland scenery, well worth the hour’s journey from Deloraine to see. According to letters to the newspapers in the early 1890s, Tongataboo had then been established some thirty years, suggesting that the settlement began in the 1860s. … Tongataboo is the name of one of the Friendly Island in the Pacific Ocean, the soil of which is remarkable for its fertility, and doubtless it was this fact that induced the late Sergeant Bulger, of Westbury, to bestow the name on the same Tasmanian settlement, as he was, I think, the first to select land there about 35 years ago. During the 1890s and early years of the 20th Century much is written about the need for a better road between Deloraine and Tongataboo. I haven’t followed the story closely but not surprisingly there is a good deal of local politics involved including concerns that money initially set aside for the road was diverted elsewhere. In 1893 ‘An Unfortunate Settler’ wrote to the Daily Telegraph urging that work commence, noting that £800 had been set aside some three years earlier and that labour was now very cheap, enabling the road to be constructed for about half what it would have cost a few years earlier. Road construction would also provide work for the unemployed, relieving ‘some of the distress that is so prevalent at the present’. The impact of the great 1890s Depression was no doubt severely felt in this already impoverished community. It will give the public an idea what a state the road is in when it requires three good horses to cart seven bags of potatoes along it, and then the driver has great difficulty in getting along without capsizing the load. The mud in some parts of this road is actually up to the horses’ bellies. It is a common occurrence to find a beast bogged on this road, and it is a pitiful sight to see the people wending their way through the mud, which is almost impossible to escape. As the greater part of the land in this district has been selected for about twenty years, it seems very hard that we should have to put up with this state of things. In fact, one settler, who has resided here for the last twenty-five years, has never been able to get a cart to his farm, and he has to carry even his flour in small parcels part of the road. Of course, the difficulty of the road presented even greater challenges when a service was required quickly: ‘If a person is taken ill it is no easy matter to get a doctor to come to this part, and more especially at night time’. I’m not sure when the roadwork was completed. There’s no news of a grand opening! But the complaints about the state of the road re-emerge in news reports of the 1930s suggesting that whatever work was done did not stand up to the traffic and conditions required of it. The farmers of Tongataboo cannot feel very proud of their little farms if the Engineer-in-Chief’s report is to be taken as true, for on passing through this settlement on 17th March last he said the land was poor, and there were only two or three starved-looking selections on the road. The selectors of Tongataboo are hard-working, honest people and deserve better treatment from the Government, for they pay their debts without troubling the Insolvent Court, which is more than some do who have better land and good roads. There is at Tongataboo about 1200 acres of land that has during the last 20 years been selected in blocks varying from 30 to 150 acres. Many of these small holdings have been considerably improved, and on several of them I saw some as good crops of wheat as I have seen this year, while the grass laid down after last summer’s burn on the newest selections is not to be surpassed by any I have seen. So that the place can hardly be considered the wretched, poor district the Engineer-in-Chief (Mr Fincham) would have one to believe. There are only two miles of really bad road where the metal and formation terminate on the road to Deloraine to where there is fairly good road through the Parkham settlement. But these two miles beggar description as they include huge rocks and deep ruts, so that vehicular traffic is out of the question, and I think the Government should formulate some scheme to enable bona fide settlers to get their produce off the land they have cleared, and abandon their wild fads of settling people on bush land, who would be as much out of place there as a belt of dogwood scrub would be in Macquarie Street, Hobart. To show the fertility of the Tongataboo soil, I may mention that the Messrs Everett have 25 acres of wheat that gives every promise of yielding from 25 to 30 bushels per acre, grown on land that twelve months ago was a thick forest in its virgin state. The scrub on this land was felled about last Christmas, and a good burn obtained, and wheat sown on the ashes in May. This will be — if all goes right — about the quickest return off bush land that I have heard of. Mr Coates has built a comfortable house on his selection and is now engaged felling scrub. Messrs Charlesworth, Hennesy and several others of the settlers have comfortable places, and there is a large State school situated in a central position. As I went along I saw that there had been a great deal of improvement made since I was through the district before. I noticed several new cottages have been erected, and what was once a dense forest is now under crop, and grain sown on it looks really well. I heard of one farmer in Tongataboo growing as much as 14 tons of potatoes to the acres this year. [In December 1908] Nice samples of new potatoes are on the market from this locality, Mr T Coates, of Tongataboo, having brought his first digging into Deloraine on Saturday, which he sold at 8lb for 1s. … Mr Coates’s farm comprises 100 acre of fine land. Peas and potatoes are looking strong and healthy, as is also his hay (Algerian) crop. Judging from the general excellence of hay crops throughout this and other districts, the yield should attain a good average, and if the price is “anything like” as farmers put it, sale will be remunerative. [In September 1909] Farmers in Tongataboo have fully 100 tons of potatoes pitted ready for market. So far no Irish blight has been reported in this vicinity. Many tons of turnips are also ready for market. Residents of Tongataboo are greatly handicapped by the number of steep hills to negotiate between the settlement and Deloraine. A public school was established in 1885. One ‘Visitor’ from Deloraine echoed the district’s preoccupation with the state of the road in the following letter to the editor, arguing that the money would have been better spent if two-thirds had been diverted towards ensuring access to the new building. The challenges presented by the state of the road were not the only impediments to gaining an education. 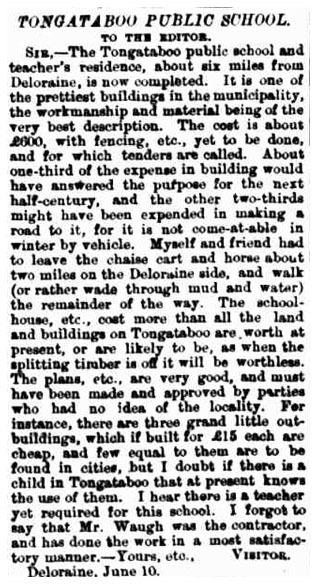 The Deloraine ‘Country News’ in July 1895 notes that ‘At Tongataboo there are some children whose parents are not able to pay school fees for them, indeed who have enough to do to get their children something to eat. There is a teacher and a State school, and it is a pity these children should be debarred from attending.’ Indeed, and even sadder to read some years earlier of 13 cases before the Deloraine Police Court for non-payment of school fees due to Mr Flannaghan, head teacher at the Tongataboo school. There is a state school at Tongataboo, built almost in the green bush, being an isolated spot. This school was closed temporarily for some weeks before Christmas owing to the teacher, Mr F Williams, falling ill, and lately passing away while in the Homeopathic Hospital in Launceston. The deceased gentleman was much thought of and highly respected both by the parents and children who reside here, and his death, though somewhat expected, was keenly felt by those who knew him. The school and residence were burnt down, in a suspected act of arson, in February 1934. Below is a little information about some of the early settlers of Tongataboo. I will add more information as it comes to hand, and welcome contributions from readers. John Charlesworth and his wife Catherine (nee O’Brien) arrived in the 1860s. Unlike many of the settlers, John was not Irish, but was from Yorskhire. Tragically John died in 1871, shortly after the birth of his ninth child and only daughter. Catherine remained on the 50 acre block and, with the help of her six surviving sons, worked the farm and increased its size to 150 acres. The Charlesworth’s son, John James, died at Tongataboo in 1892 and the Daily Telegraph’s report tells us a little more about his circumstances, and those of others under threat of the ‘influenza epidemic’. The influenza epidemic, which still lingers in this district, has recently removed one who could be ill-spared, and what was a few weeks ago a happy, if humble, home in the bush is now desolate, for the breadwinner has been called away suddenly and a widow with four young children left in the poorest of poor circumstances. Those who knew the late Mr John Charlesworth, of Tongataboo, can testify that he was a most industrious man, who wrought hard to subdue a portion of the unreclaimed forest in order to make a home for himself and his family, and if those he loved are now left destitute the fault was not his. Those feeling charitably disposed were called upon to attend a benefit concert at the Deloraine Town Hall. John’s wife was Ellen Broomhall, my GGG Aunt, daughter of Welsh-born James Broomhall and Irish-born Catherine Coan. The Broomhalls lived at nearby Reedy Marsh. In September 1906, the Daily Telegraph reported the death of Mrs James Everett of Woodcott, Tongataboo. She was 75 and had lived in the district for 55 years. She left four sons and a daughter to mourn her passing.